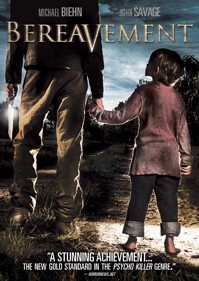 Six year old Martin Bristol is abducted from his yard by psychopath Graham Sutter, who has a penchant for hanging women in his basement and brutally butchering them. He keeps Martin as a protege of sorts, exposing him to the slaughters and eventually teaching him what it takes to murder. When Allison moves in with her uncle who happens to reside next door to Sutter's slaughterhouse, her curiosity about the creepy neighboring property gets the best of her, resulting in a blood soaked climax. The long-awaited prequel to 2004's Malevolence, a fabulous homage to Halloween and Friday the 13th and easily one of the best slasher films of the last decade, extremely high expectations were had going into Bereavement. Director Mena proved to have a real talent for creating Carpenter-like tension and suspense with Malevolence, but unfortunately he fails to showcase it with this prequel. Instead, he focuses on characterization and drama, buffered with brutal, though repetitive, murder scenes. The price to be paid is a complete lack of suspense and scares that were replete in the first film. Characterization is crucial to a successful horror film, but it just does not click the way it should in this film. The Allison character (Alexandra Daddario) never garners the sympathy from the viewer that she should simply because she comes off as having such a huge chip on her shoulder through the entire film that is a difficult to sympathize with her. It doesn't help that the character of Allison makes some incredibly blatant and stupid decisions in the latter half of the film that really squash any last minute chance for sympathy from the viewer. And the Graham Sutter character is interesting and decently portrayed by Brett Rickaby, but again, the characterization is not handled appropriately and, as a result, the character comes off as cartoonish at times. Similarly, young Martin's abrupt transition from meek, timid, and unwilling victim to ruthless killing machine during the climax definitely raises eyebrows. It seems Mena over thought this script and tried to more it more complicated than it needed to be; fans of Malevolence know how great Mena works with simplicity. However, to his credit, Bereavement is a great looking film. While it lacks the camera created suspense of the original, the cinematography is gorgeous. The slaughterhouse setting is creepy and there are some uncomfortable and mean spirited sequences that will cause some wincing. But certainly where the film gains points is the ballsy climax; sure, fans of the first film may know the only possible manner in which this film could end, but kudos to Mena for making it so unrelenting and bold. Too many times slasher films play it safe, but that is certainly not the case with Bereavement. It's and ending that will potentially stick with the viewer for some time after the film is ejected, and small scene after the credits have rolled ties nicely into Malevolence. Overall, Bereavement does not even come close to being as an effective film as Malevolence, but there still are glimpses of Mena's potential and a force to be reckoned with in the genre if he sticks with the less-is-more formula.